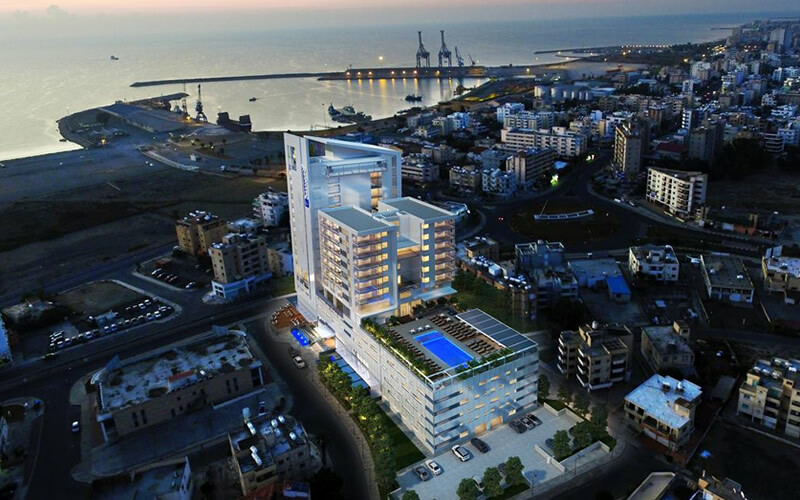 A new hotel in central Larnaca has opened its doors for visitors and business customers – the Radisson Blu. It is a perfect addition to Radisson Blu’s growing portfolio based in Europe’s most desirable travel hotspots. Set in beating heart of the city center (and facing the sea), the hotel gives visitors the ability to discover both the modern and ancient sides of Larnaca’s culture – including its thriving sea port and waterfront lined with palm trees. It’s exactly the kind of iconic setting that resonates with the design heritage of Radisson Blu – especially with the stunning sea views available from the distinctive hotel building. Sunbathers and swimmers are also well catered for; the hotel is located just 2km from a gorgeous Mediterranean beach where they can spend the day relaxing on by the sea. The hotel’s 106 rooms and suites showcase modern design highlighted with local flourishes. All rooms have a balcony with spectacular views of the vibrant coast and bustling harbor scenery. Guests are also in for a treat with a fitness center and an outdoor swimming pool that allows them to soak up the best of Cyprus in this amazing city. Diners can enjoy the finest international cuisine (featuring locally inspired dishes) alongside panoramic views of Larnaca at the hotel’s remarkable restaurant. The Radisson Blu Hotel, Larnaca is also home to three different bar concepts – including the Lobby Lounge & Bar with its cosmopolitan atmosphere and the stunning Skybar on the 16th floor, which allows guests to unwind with ocean views and craft cocktails. This presents an opportunity to enter the market with unprecedented business and meeting facilities, which will give Radisson Hotel Group the leverage to build on its award-winning Radisson Meetings offering. The hotel has a prime location in the city. Beyond its gorgeous location, one of the stand-out features of the hotel is its modern meetings and events space, featuring 5 meeting rooms and a spacious conference room able to rise to any and every occasion. Part of the Radisson Hotel Group’s award-winning Radisson Meetings service, business travelers are guaranteed an event unlike any other – especially in the rooftop conference room with exactly the views you’d expect from such a vantage point.